Residents of Borno on reacted to the suspension of one of its son who was suspended by the senate and they expressed shock over the six months suspension slammed on former Senate Leader, Alhaji Muhammad Ndume, by the leadership of the Senate. NAN reports A cross section of those interviewed in Maiduguri said that the action was unfortunate and undemocratic. Malam Musa Walama, an Iron-Bender, said that the suspension was undemocratic “I was saddened by the news of suspension of Ali Ndume from the Senate, I kept thinking about the issue through out yesterday. “It is really a sad development that the Senate has decided to suspend him for standing by the truth,” Walama said. He said that the action had portrayed the leadership of the Senate negatively “What kind of message are the senators trying to pass to the world? “Are they saying that anybody standing by the truth will not survive,” Walama said. “They said that he was suspended for telling lies against the Senate President and Senator Dino Melaye but the truth is that the senators are not comfortable with his open fight against corruption and corrupt practice,” Asheikh said. “We learnt that he is heading to the court to challenge the suspension. “We will pray for him to succeed by God grace,” Musa said. Other residents who spoke described the development as worrisome and an indication that the country’s democracy still had a long way to go. 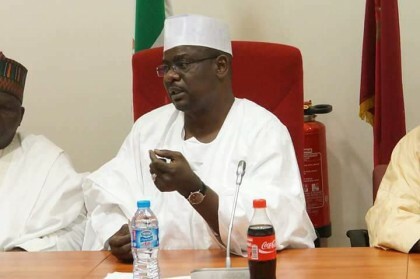 Ndume, Senator representing Borno South District, was suspended for allegedly raising false alarm pertaining a report carried by the media on Sen. Dino Melaye and Senate President Bukola Saraki.